Last weekend saw us join up with a really great set of folk, detecting near the east coast, the travelling wasn’t a chore, stunning scenery in the early morning sunshine had already put me and Garry in a good mood, 10 miles from destination however saw a blanket of fog appear! That soon lifted and by 9 am we were detecting on some damp stubble in the hope of a few Roman coins and artefacts to make an appearance, my start wasn’t brilliant, I opted for the Tiger coil on my Teknetics G2+, Such a good combination in the past but seriously bad on wet stubble, its almost like the coil goes” Live” and is almost impossible to use with any degree of enjoyment or performance, so I was back at the car, cursing my choice and frantically screwing my Cors Fortune coil back on, which has always done me proud in the stubble stalks. The first couple of hours saw very little action for me, the odd and I mean the odd scrap of lead, button, centre part of the shotgun shell, modern junk of cans etc, one or two of the others were picking up roman coins and Garry hit a lovely little Bronze, 4th century in date, 11:30 came and my stomach was telling me it was empty so I worked my way back to the entrance of the field with a view to nipping back to eat my pack-up in double quick time, however I hit a patch, nothing special but two Roman Bronzes, a Bee-hive thimble and a small medieval mount was enough for me to stay in that area for at least another half hour, nothing else came to light so dinner it was! After lunch the gang moved to a different area and I was soon striding out to see if I could find a productive area, a couple of Hammered coins came to light which always gives you hope so the concentration levels were up to maximum, coke cans, bits of them here and there had me digging for the first few targets, then a strip of bronze, but very little else, I hit the top of the field and decided to change search direction to east/west. 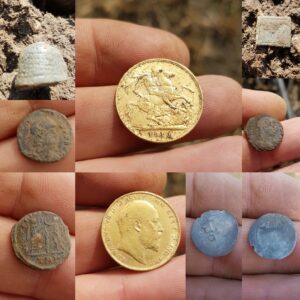 The soil conditions were ideal, lovely soft, rich soil which was really easy to dig had me hitting deeper targets deeper than I normally would, some of the small buttons, copper coins were coming up from impressive depths, I was impressed! 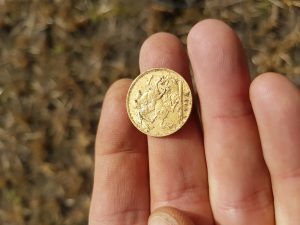 then I hit a signal that flashed up 7-78 on the screen, I knelt down, stuck the spade into the soft soil and removed the earth, something to my left caught my eye that looked remarkably like Gold…i stared at it for at least 10 seconds, my mind told me it was everything but a coin, foil? bottle top? 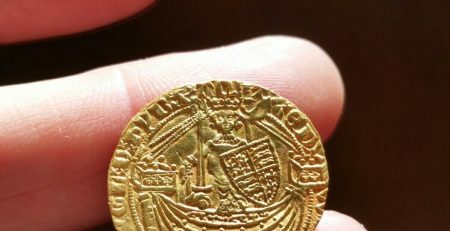 Cant be as its perfectly round I thought, so my left hand stretched out to pick it up, immediately the weight gave it away, A gold sovereign, George slaying the dragon on the reverse with King Edwards head on the front, 1910 in date, I was made up, all the hours and hours of toil paid off again, as I held it out to show a couple of guy near me I relished the feeling as it doesn’t happen nearly enough! Normally when I find Gold I pack up, I say to myself that ive had my luck for the day and I either wander back to the car or if its late enough I go home, but it was only half one!, so I talked a little, gathered my composure and detecting until 5 ish, I managed to winkle out a silver hammered penny later on and that was my day, driving back through some of the glorious Yorkshire/Lancashire countryside the feeling of well-being hit me, a feeling that detecting, at times can bring to you, through all the hustle and bustle of every day life, the pressures of business, sometimes its just nice to have that peace of mind and enjoyment that the day has just brought, for all the toil through the fields, the cold, wet, damp, the hours of junk that you dig up, that glimpse of Gold is what keeps us going and what spurs us on, Some, if not most will have seen the images on social media sites, and ok its not ancient gold, but its still a special coin, one that will live long in my memory because of the joy it brought, and along with great company on the day and the smashing weather I couldn’t have asked for a better outcome!